This family-friendly weeknight entree comes together in a snap. 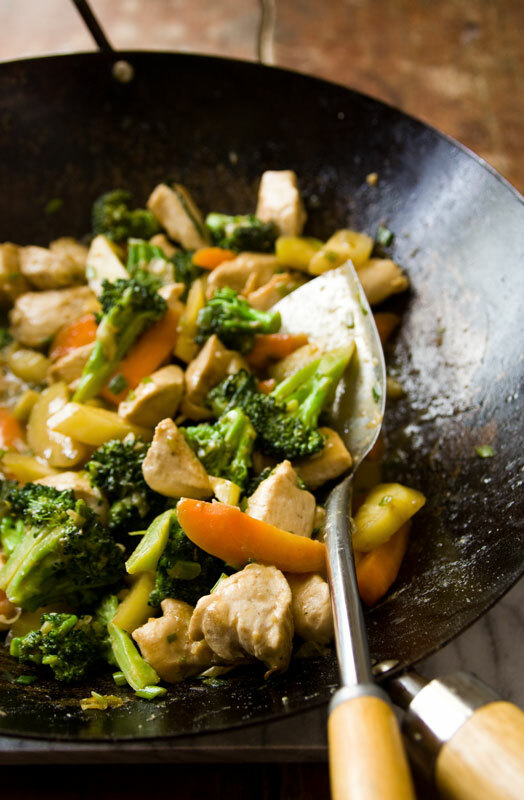 Just make sure to prep your chicken, broccoli, the maple tahini sauce and other stir-fry ingredients before you start cooking. It is naturally gluten-free if you use tamari soy sauce. This past weekend was a big one for the state of Vermont. It was the Maple Open House weekend. That’s when Vermont sugar houses open their doors to the public. This resulted in a steady stream of cars jostling and bumping up our muddy, rutted road to reach our neighbor’s sugar house at the top of our hill. Several of the cars lost their mufflers in the process. 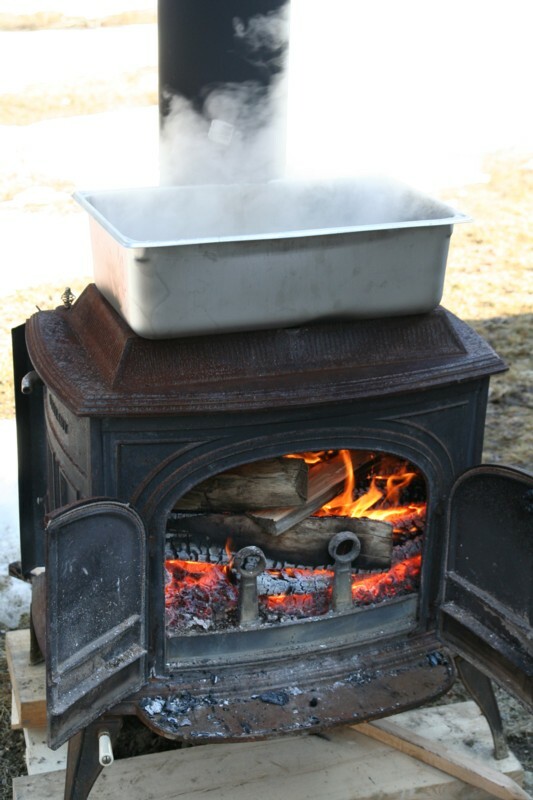 This served as an amusing diversion as we watched the steam rise from our own make-shift maple sugaring operation in our driveway. As a result of my husband’s laboriously lugging buckets of sap, my family spent the better half of our weekend in the sun and snow, surrounded by neighbors and the scent of syrup. More than twenty friends randomly came by to visit (in various mud-splattered vehicles) all to say hi and enjoy a much loved Vermont tradition. 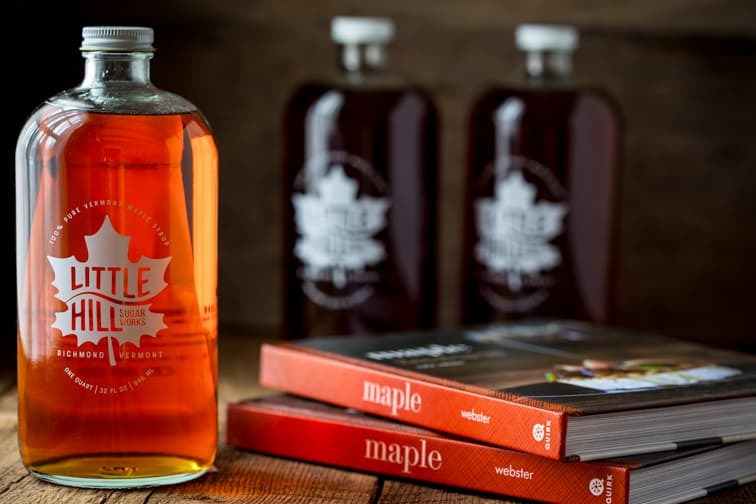 Buy Our Home-Made Maple Syrup Here! 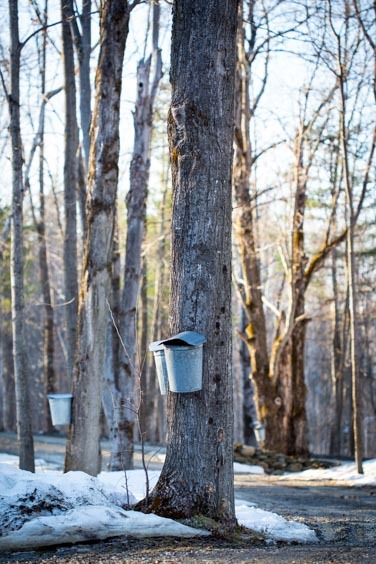 Maple sugaring serves as a family friendly mud-season diversion, and it helps our economy (Vermont is the country’s largest producer of syrup, oh yeah! ), and it results in a lot of liquid gold. With plenty of it around we use it to sweeten everything from smoothies, and salad dressing to our morning coffee and even stir-fries. The great thing is it also adds rich maple flavor, so you need less of it than straight up sugar. And that’s important because while maple is delicious, we should all watch our sugar intake. Use it in moderation says Kay Tran R.D., certified Diabetes Educator. She explains “there is not a significant change in nutrients between the different sugars.” Tran gives us a ballpark for what we should aim for in our diet for added sugars. She points to the recommendations of the American Heart Association, “They say added sugars should not exceed 150 calories a day for men or 100 calories a day for women.” That’s only two tablespoons of maple syrup or other sugar for women! In honor of maple season I developed this recipe for stir fried chicken. I’ve added two tablespoons of maple syrup to the whole recipe (which serves 4) to give it a special maple flavor and slight sweetness, but it won’t blow your sugar budget for the day. I’ve made this recipe for several years now, and recently, I decided to try it out in my wok. I have had my wok since I was sixteen. I have to admit, I probably just wanted a wok because I felt like such a badass cooking for my friends with it. Now, a million years later, it is perfectly seasoned and I love it dearly. If you don’t have one, a simple wok setis actually pretty affordable. The trick is knowing how to season it and care for it. This post on culinate is a really good guide for how to season a wok. I use my wok pretty regularly because it is a great way to cook tofu, seafood, meat and vegetables with high heat, tons of flavor and not a lot of fat. 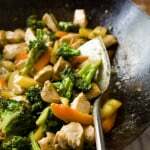 It is a misconception that you need to use a lot of fat to “stir-fry.” As long as you have a lid, you can use a small amount of oil. This recipe only uses 1 teaspoon of oil per serving. The trick is getting a sear on the meat using only a little oil first. Remove that, then cook the aromatics in a little oil too. Then add broth and cover to cook the veggies. That way the vegetables steam to cook, instead of frying. One thing to keep in mind is to make sure you have all your ingredients ready to go before you start to cook. [French culinary term of the week: this is called mise en place.] 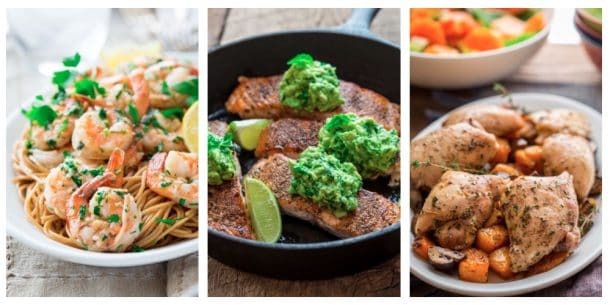 The cooking happens so fast, you won’t have time to chop vegetables or measure out the sauce while you are woking it up! By the way, if you don’t have a wok, this recipe works fine in a large heavy bottomed stainless skillet. But the sixteen year old in me would have to say that’s just not as badass. 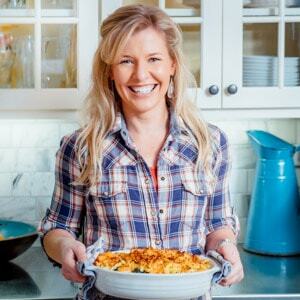 Click here to browse all the Maple Recipes on Healthy Seasonal Recipes. 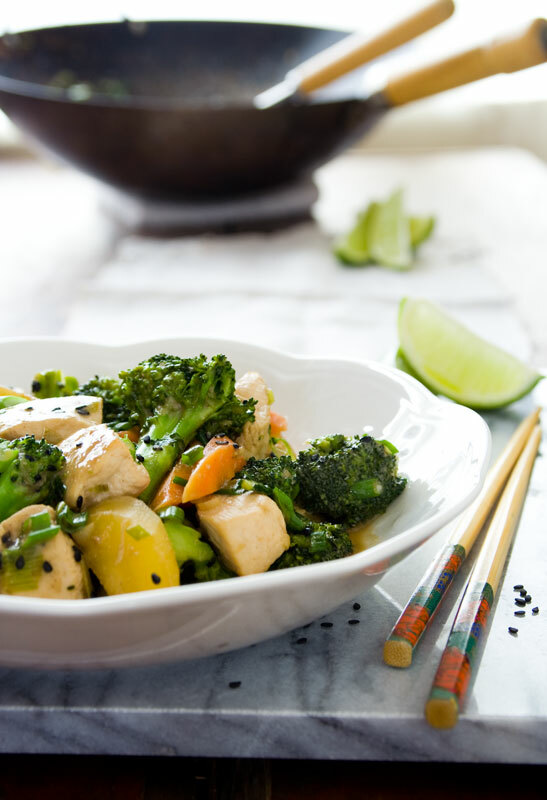 This Healthy Maple Tahini Chicken and Broccoli Sir-fry is perfect for a family-friendly weeknight meal. Use tamari to make it gluten-free. Whisk maple syrup, tahini, tamari or soy sauce, cornstarch and salt in a small bowl and set aside. 2. Heat wok or large skillet over high heat. Add 2 teaspoons oil and swirl to coat wok or bottom of skillet. Add chicken, sprinkle with pepper and cook, turning once or twice until browned, 5 to 6 minutes. Note* the chicken will not be fully cooked and will continue cooking in the sauce in step 4. Remove the chicken to a plate. 3. Add the remaining 2 teaspoons canola to the skillet, followed by the scallion whites and ginger. Cook, stirring until fragrant, 15 to 30 seconds. Add broth and bring to a simmer, scraping up any browned bits. Add broccoli and carrots, cover and simmer, stirring once or twice until the broccoli is bright green and the vegetables are still crisp but starting to soften slightly, 4 to 5 minutes. 4. Stir sauce, the chicken and any accumulated juices from the plate into the vegetables and continue cooking, stirring often until the chicken is cooked through and the sauce is thickened, 4 to 5 minutes. Stir in reserved scallion greens, lime juice and sesame seeds. I love my wok as well, and my dad loves a good stir fry so I tend to make them quite a bit! This one looks great. I’ll definitely be getting out my wok for this. maple, tahini, and broccoli – all of my favorite things! My whole family would love this recipe and that’s a huge win for me. I love the flavor combo of the maple and tahini. Great idea! Maple and Tahini? That sounds like the perfect combo! What a great recipe! I’m a big fan of Tahini! Stir fry’s are great, and so much better than takeout. Lots of great flavours and colours. Leftovers would be great for lunch the next day. Thank you Gloria! I love the left-overs too! So healthy and satisfying for lunch.